/ Home / Business and partners / Business services / Enterprise Solutions / Where are they now? 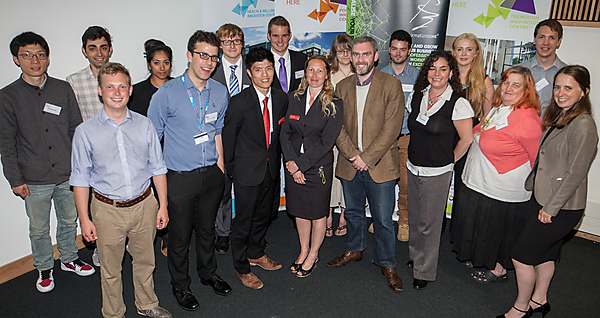 The winners of the Tectona Business Challenge are announced during a celebratory awards event, attended by participants and sponsors. Jon and Tom decided to develop an award-winning app that Jon created as part of a Hackathon held in Plymouth. The Hackathon was sponsored by Devon County Council who opened up data sets to developers and the general public in order to inspire useful software projects, all created within 24 hours. The two University of Plymouth students entered the Tectona Business Challenge where they accessed free workshops and expert advice sessions to create a business plan for the app that provides customisable information on an area based on user preferences. After judging by an independent panel of experts, they were awarded a business start-up package including seed-funding from Santander, support from Formation Zone and a tailored market report from Marketest . Six months on and their company, WeStreet, has been set up with a pilot app due to be launched very soon with a local estate agency. The Marketest report has enabled them to get a clear idea of their target customer which has informed their marketing, brand and pricing strategies. Seed funding has ensured that the company has a robust IT infrastructure, effective website terms and conditions as well as business tools to fund productivity. Support provided by Formation Zone advisor sessions has also helped to produce product timelines and financial forecasts. "Everything that we have achieved as a result of our presence in the Formnation Zone has enabled us to take our concept and business to the next level and allowed us to explore our service possibilities." Francesco and Theo entered the Tectona Business Challenge in June 2014 in order to get support to develop their business: Future Framework. The idea behind Future Framework is to give people the skills needed to thrive in a more connected world. Whilst accessing the range of workshops and expert one-to-one sessions available through the Tectona Business Challenge, they launched a pilot programme of interactive workshops in the areas of digital literacy, communication and enterprise across seven schools in Plymouth and Devon. Feedback was good - over 85 per cent of students who participated in the workshops felt that their future employability had improved. After submitting their business plan they were delighted to discover that they had won seed funding from Santander, a marketing session with A E Group and an UnLtd 'Do It' grant. Tectona’s practical support also allowed Francesco and Theo to develop their product and strategy away from a solely schools focus to a wider range of markets including business and individuals. "Winning the Tectona Business Challenge has given us such a fantastic boost forward with the business." Geoff was part of the team who got support for a business idea for a socially responsible, high-quality catering company through the June 2013 Tectona Business Challenge. Since winning a cash starter prize and Formation Zone support in the Challenge, Munch Movement has been launched offering fresh pizzas made using local, natural ingredients and cooked on an eco-friendly woodburning cooker – called Magnus! Geoff also teamed up with the charity Mary’s Meals to create an initiative called Buy One, Feed Another (BOFA). All Munch Movement pizzas sold come with the promise of a donation to the charity equal to a week’s worth of school meals for a child in Malawi. "The expert days were fantastic, the chance to meet with legal, financial and marketing professionals provided the opportunity to fine tune ideas and have potential issues highlighted. The entire process of Tectona is supportive and guides you through the writing of a business plan from start to submission. The appraisal of the business plans are priceless, gaining many an experts feedback; further strengthening the proposal. Munch Movement would not have progressed in the way that it has without the help of Plymouth University, the Formation Zone and the Tectona business Challenge. We’re excited to say, from the early beginnings of Mobile Catering, we are now transitioning and expanding into the retail sector with a range of Munch Movement pizzas." Andrew used his startup package to develop his social enterprise, South West Fish, a business with the aim of changing the fishing industry 'one fish at a time.' Since receiving his award Andrew has increased the company's attendance at various markets and food festivals across Devon and Cornwall, encouraging people to sample fresh local seafood, raising awareness of the marine environment and market supply chains and thereby helping to protect the livelihoods of fishing communities. Andrew has also launched a new product called the 'Fish Off Challenge' in partnership with Igniting Enterprise at University of Plymouth, raising awareness of fish and the fishing industry amongst students. "Winning the Tectona Business Challenge was an immense achievement. The funding received from UnLtd and Formation Zone has laid the foundations for future growth of the business."